So, we have debated Bond girls, but none of this would be possible without the genius of Fleming. 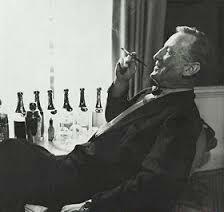 He is like Hammett or Chandler, a C20th creator of the hard man sleuth, who is also a hard drinker. The movies are another genre, but after a Bond movie I hope every man in the audience walks out a foot taller. And, actually, I hope the same for every woman walking out of Wonder Woman.